Turmeric may be the most effective nutritional supplement in existence. Turmeric (Curcuma longa) is the plant we all know for a spice that gives curry its yellow colour. Turmeric is widely used as a spice all over the world in cooking. Many Persian dishes use turmeric as a starter ingredient. Almost all Iranian dishes are started using onions caramelized in oil and turmeric, followed by other ingredients. In India and Nepal, turmeric is widely grown and extensively used in many vegetable and meat dishes for its colour and is also used for its supposed value in traditional medicine. Let’s see some of the amazing health benefits and uses of turmeric here on this page. Turmeric medical properties of health benefits including antibacterial and antibiotic effects are known to human beings long back from 5,000 years. Scientific research also states today this ancient spice has truly remarkable healing properties. Turmeric is a natural antiseptic and antibacterial with antibiotic properties that have historically been used as an agent to treat everything from minor cuts and scrapes to scabies, skin ulcers and even leprosy. Turmeric is also a powerful topical antibiotic which helps to prevent infections and sepsis in wounds. Acne, psoriasis, eczema and other skin conditions also benefit from the antibacterial action of the spice. It is considered a symbol of purity, prosperity, and fertility. Turmeric contains dozens of powerful compounds including a powerful active chemical compound called curcumin. This compound is not only responsible for its vibrant yellow-orange colour and its distinctive flavour, but it also gives Turmeric some of its powerful health benefits. It is a natural antiseptic and antibacterial agent and can be used as an effective disinfectant. If you have a cut or burn, you can sprinkle turmeric powder on the affected area to speed up the healing process. 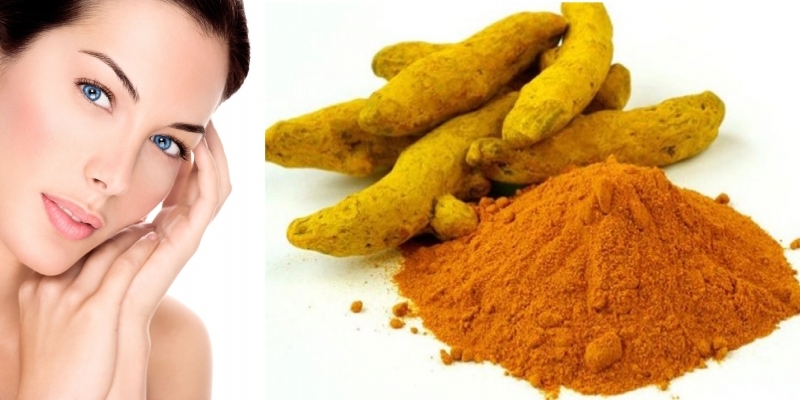 Turmeric also helps repair damaged skin and may be used to treat psoriasis and other inflammatory skin conditions. Turmeric powder is an effective home remedy for a chronic cough and cold and throat irritations. Turmeric is used for arthritis, heartburn, stomach pain, diarrhoea, intestinal gas, stomach bloating, loss of appetite, jaundice, liver problems and gallbladder disorders. It is also used for headaches, bronchitis, colds, lung infections, fibromyalgia, leprosy, fever, menstrual problems, and cancer. Other uses include depression, Alzheimer’s disease, water retention, worms, and kidney problems. Curcumin is the main active ingredient in turmeric. It has powerful anti-inflammatory effects and is very strong. Some people apply turmeric to the skin for pain, ringworm, bruising, leech bites, eye infections, inflammatory skin conditions, soreness inside of the mouth, and infected wounds. Curcumin leads to several changes on the molecular level that may help prevent and perhaps even treat cancer.It has incredible benefits against depression. It also helps to promote Weight loss and reduce the incidence of obesity-related diseases. Benefits and Uses of Turmeric include treating sprains and swellings with a pinch of turmeric powder, lime and salt is an age-old home remedy. Benefits and Uses of Turmeric in food and manufacturing, the essential oil of turmeric are used in perfumes, and its resin is used as a flavour and colour component in foods antioxidant. Turmeric dramatically increases the antioxidant capacity of the body. Benefits and Uses of Turmeric in Pesticides: Sprinkle turmeric (powder) water near all the entry points of your house to the wards of insects, ants, and termites. Turmeric has an important place in the Indian weddings. Turmeric paste is applied to the bride and the groom as part of the Haldi ceremony just before the wedding to give them fresh glowing skins and to ward off the evil eye. Women’s uses turmeric in skin products such as creams and body scrubs to boost the glow factor. Because turmeric is associated with fertility and prosperity, it is used during the Haldi ceremony in weddings. The powder is mixed with water to form a paste and family members apply it to the bride and groom’s face and body.